Homemade, healthy and delicious feed. 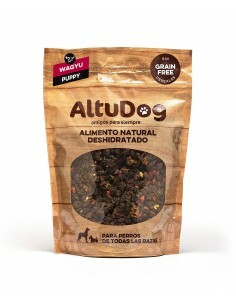 Buy this AltuDog Wagyu Junior GRAIN FREE sample so you can see if your dogs loves it! And obtain a discount of 5€ for your next online order. 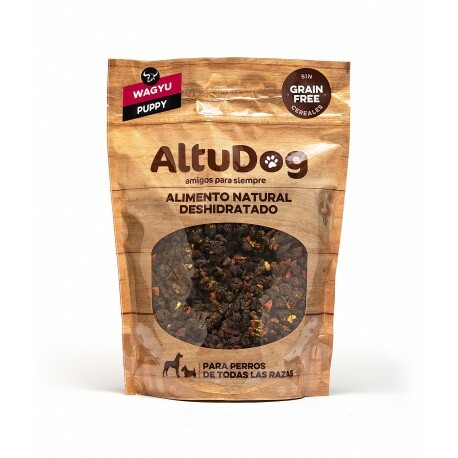 Full and natural food for all breeds of pups up to the age of 10 months or pregnant animals. Processed in our own human food processing plant using ingredients that are fit for human consumption. 1 sachets of 250g which correspond to 1kg of fresh food. Feed once or twice per day and ideally at room temperature. Feeding requirements do differ depending on your pet's breed, age and activity level. If your pet is overweight or underweight then adjust the amount fed accordingly. Ingredients: Wagyu dehydrated beef 75%, dehydrated fruits and vegetables 10% (potato, carrot, tomato, spinach, apple and cranberry), Wagyu fat 8%, whole egg with shell 3%, Wagyu heart 2%, salmon oil, seaweed, garlic powder, turmeric and rosemary extract.